Building Innovation 2019: Registration is Open! Nearly 30 real estate industry organizations representing more than 10 million jobs collaborated on a new website to highlight the diverse career paths within the real estate sector. Students in high school, college, technical programs and community colleges can explore possible career pathways within real estate by taking an interactive quiz to discover career opportunities. Find out more. In less than four months, the entire industry will come together to collaborate on improving the built environment. 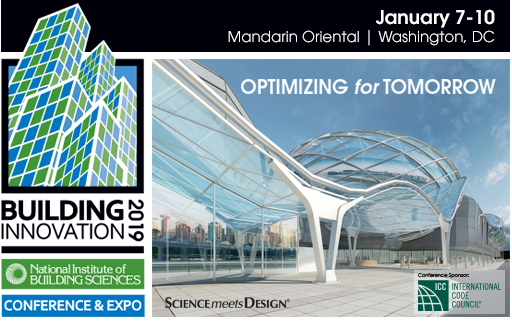 Register today to join us for Building Innovation 2019: The National Institute of Building Sciences Seventh Annual Conference and Expo, January 7-10 2019, at the five-star Mandarin Oriental in Washington, D.C. Register now to be there where Science meets Design® to participate alongside others involved in planning, designing, procuring, constructing, operating, maintaining and retiring physical facilities as we explore strategies that are aimed at Optimizing for Tomorrow. Three tracks of educational sessions and a bonus day of building enclosure commissioning workshops will take place over three days of Building Innovation 2019. The program covers a wide range of topics that are relevant to the industry as a whole and will unite the entire community in developing solutions for the built environment. The program schedule is full of activities that support the goals of the Institute in bringing the community together to seek solutions. The four-day Conference provides an exciting, balanced, interactive and educational event. Early registration offers $250 off the onsite registration rates. So don’t delay. Early-bird rates end October 31, 2018. View the preliminary schedule of events and register at www.nibs.org/conference2019. 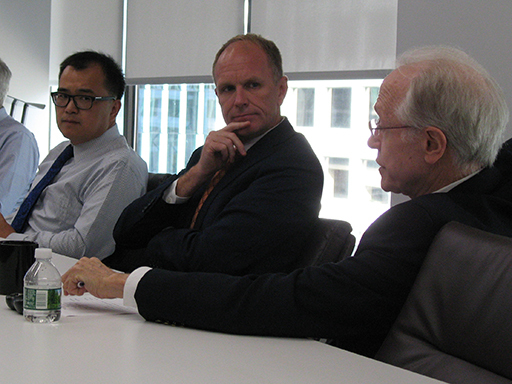 Multihazard Mitigation Council (MMC) Chair Bryan Koon (center), Program Director Phil Schneider (right) and Program Manager Jiqiu Yuan present during the Coordinating Council meeting held this week at the Institute. Council and committee chairs meet several times per year to share program updates. The MMC highlighted its progress on the Mitigation Saves Interim Report as well as its work on incentivizing investments in resilience. Find out more about the Coordinating Council. 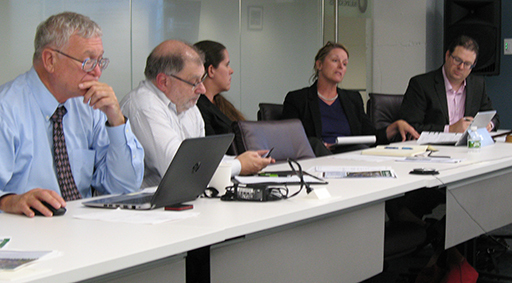 Vicki Worden (second from right), chair of the Consultative Council, addresses fellow members during the Council’s meeting September 25. The Council is working to finalize the findings and recommendations that will serve as the basis for its 2018 Moving Forward Report to the President of the United States and the U.S. Congress. The report will be available at Building Innovation 2019. Learn more about the Consultative Council. 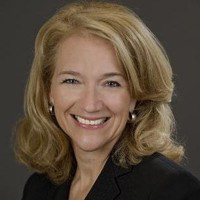 National Institute of Building Sciences Board Member Anne M. Ellis, PE, FACI, F.ASCE will become the new executive director of the Charles Pankow Foundation, effective October 1. The Foundation’s board appointed her this past week. Founder and chief executive officer of Ellis Global, Ellis previously served as a special advisor to the Foundation’s Board to rally support for collaborative innovation in the architecture, engineering and construction (AEC) industries. The Charles Pankow Foundation leads industry collaborations, funds research and projects, and delivers solutions that enable the AEC industry to advance innovation in the design and construction of buildings. In her new role, Ellis will focus on expanding the foundation’s transformational impact by engaging a broader swath of the AEC industry. Read the announcement. A new web-based tool can help security professionals for commercial office buildings perform assessments based on the Best Practices for Anti-Terrorism Security (BPATS) for commercial office buildings. With best practices developed by the U.S. Department of Homeland Security (DHS) Science and Technology Directorate (S&T), in partnership with the National Institute of Building Sciences, building owners seeking protections under the Support Anti-Terrorism by Fostering Effective Technologies (SAFETY) Act can use the tool when developing their application packages. An issue that arises for building owners seeking SAFETY Act protections is the need to re-submit applications due to gaps in the review for SAFETY Act eligibility. This new online format serves to eliminate such backtracking from the application process, outlining what a building needs to accomplish to become a candidate for Qualified Anti-Terrorism Technology (QATT) status. Preferred users are trained security professionals whose credentials will be reviewed by the Institute before gaining access to the tool. They are then trained in using the checklist to evaluate various components of building security by SAFETY Act standards, including access control, risk awareness, physical security, IT security and more. The guide spans seven categories, 411 best practices and approximately 60 associated common practices. Read the announcement. Commercial property owners and security professionals, may request access to the BPATS tool here. 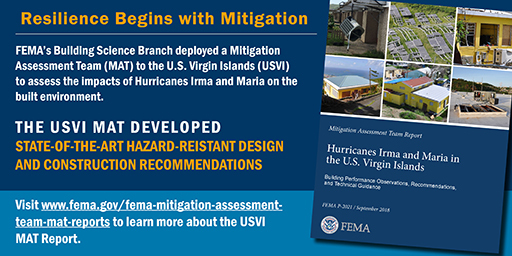 The Federal Emergency Management (FEMA) just released the report of results for its Mitigation Assessment Team (MAT) in the U.S. Virgin Islands. In response to a request for technical support from the FEMA Joint Field Office in St. Croix, FEMA’s Federal Insurance and Mitigation Administration’s (FIMA) Building Science Branch deployed a MAT composed of national and regional experts to affected areas in St. Thomas, St. John and St. Croix in October and November, 2017. The report, FEMA P-2021 | Mitigation Assessment Team Report: Hurricanes Irma and Maria in the U.S. Virgin Islands, compiles their evaluation. The MAT was charged with evaluating damage from Hurricanes Irma and Maria, especially for buildings constructed or reconstructed after Hurricane Marilyn (1995), to identify both successful and unsuccessful mitigation techniques. This work involved: assessing the performance of residential, nonresidential and critical facilities affected by the storms; evaluating the performance of photovoltaic (PV) facilities; investigating the effects of wind speed-up due to the islands’ topography on building performance; and meeting with residents and local officials to better understand what transpired during and after the storms. View the report. Bringing a new facility to life and integrating it with an existing asset portfolio can be a stressful endeavor. The receiving organization is expected to operate, manage and maintain the building with finite resources, yet the owner may be faced with a newly constructed facility that underperforms, requires unplanned downtime or additional rework, or provides a lesser occupant or visitor experience. The Facility Maintenance and Operations Committee (FMOC) will host a one-hour webinar, Transitioning a New Facility from Construction to Operations and Asset Management, scheduled for Friday, October 5, from 12:00 to 1:00 pm ET, that focuses on making that transition as successful as possible. The presenter, FMOC Chair Casey Martin, AIA, AICP, works in the consulting practice at Jacobs Engineering delivering facility and asset management strategies. Read the news release. Sign up to attend the webinar. The National Institute of Building Sciences announces the appointment of Nancy McNabb, AIA; Jason Hartke, PhD; and Arpan Bakshi as the jury for the 2018 Beyond Green™ High-Performance Building and Community Awards. The Beyond Green™ High-Performance Building and Community Awards recognize those buildings, initiatives and innovations that are influencing, informing and inspiring the high-performance planning, design, construction and operations processes. The jury is responsible for selecting those projects and activities that best exemplify the eight design objectives of high performance from all of the entries submitted to the Institute by the October 31 deadline. The Institute will recognize the 2018 award winners on Wednesday, January 9, 2019, during its Annual Awards Banquet. As part of the awards presentation, the Beyond Green™ High-Performance Building and Community Award winners have the opportunity to present their projects and highlight the challenges and opportunities they faced while delivering high-performance buildings. Learn more about the jury. Submit a Beyond Green™ entry. Missed the Facility Maintenance and Operations Committee (FMOC) webinar “Designing for Maintainability: The Importance of Operations and Maintenance Considerations during the Design Phase of Construction Projects”? The one-hour audio presentation, which FMOC hosted on September 14, is now available to download. During his presentation, Darrell Rounds, FMA, CEM, the immediate past chair of the FMOC and a current member of the Institute’s Board of Directors, discussed a methodology that links operations and maintenance goals to the design process that can be applied to any organization. Find out how working with facility professionals during the design phase of the project can alleviate costs and help optimize building performance. The audio presentation is available until October 13, 2018. Listen now. Officials from the Architecture and Building Research Institute in Taiwan’s Ministry of the Interior learn about the Institute’s WBDG Whole Building Design Guide® during an informational presentation by Institute Vice President Ryan Colker (left) and Program Director Roger Grant (not pictured) on September 6. 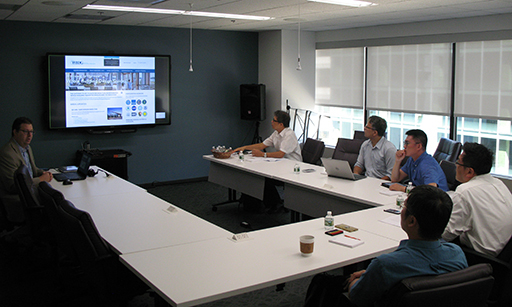 The Taiwanese delegation visited agencies in New York City and Washington, D.C. to collect data on how the U.S. building industry is using building information modeling (BIM). The presenters highlighted the National BIM Standard-United States®, Construction to Operations Building information exchange (COBie) data and other related programs that support the industry. 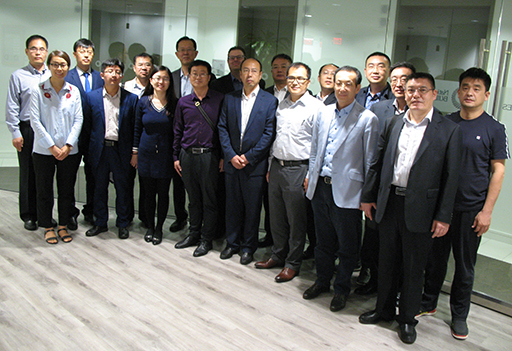 A delegation of 17 officials and engineers from the Shandong (China) Provincial Department of Housing and Urban-Rural Development convene at the Institute September 11 to learn about the Institute’s role in the United States building industry. The department, which is responsible for overseeing all housing and urban construction projects in Shandong Province, received an overview of the Institute’s program areas. The delegation was particularly interested in building information modeling, off-site construction and high-performance building. © 2018 National Institute of Building Sciences. All Rights Reserved.